This book features a perfect early learning activity workbook for toddlers ages 3 - 5 years. It introduces basic shapes and numbers in a fun way for them to practice their motor skills by coloring activities. Each page is printed on one side only especially to prevent color bleed.In this book, we provides easy and basic pages of shapes for toddlers to color, while learning to count as well. 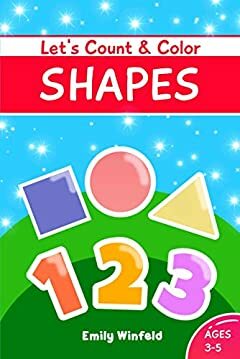 As an early introduction, this book covers basic shapes include square, circle, triangle, rectangle, heart, oval, diamond, pentagon, hexagon and star. While for counting, we introduce number 1 to 10.This activity book features a perfect size of 6" x 9", which is a handy book size to bring out if necessary. It will surely keep the toddlers busy for hours while learning about shapes, numbers and colors in the most exciting way!